China’s navy is getting bigger and better and doing it at a speed unmatched by any nation around the globe. Earlier this month, the People’s Liberation Army Navy launched two 13,000-ton Type 055 guided-missile destroyers — Asia’s largest, most sophisticated and most lethal combat ships. “This ship in particular has a sophisticated design, stealth features, radars, and a large missile inventory. It is larger and more powerful than most US, Japanese, and South Korean destroyers,” said Rand Corp. senior analyst Timothy Heath. The double launching shows Beijing’s unmatched military shipbuilding ability and its desire to project naval power far from Chinese shores, said Heath and other military analysts. One of the two Type 055 guided-missile destroyers takes water at a shipyard in Dailan. China says each new destroyer will have 112 vertical launch tubes, from which it can fire long-range attack missiles, the equivalent of the US Navy’s Tomahawk missile used as recently as Washington’s strikes in Syria this year. The missile launchers can also carry weaponry to target incoming aircraft, enemy ships and missiles. Anti-submarine warfare operations are the responsibility of two helicopters aboard each Type 055. 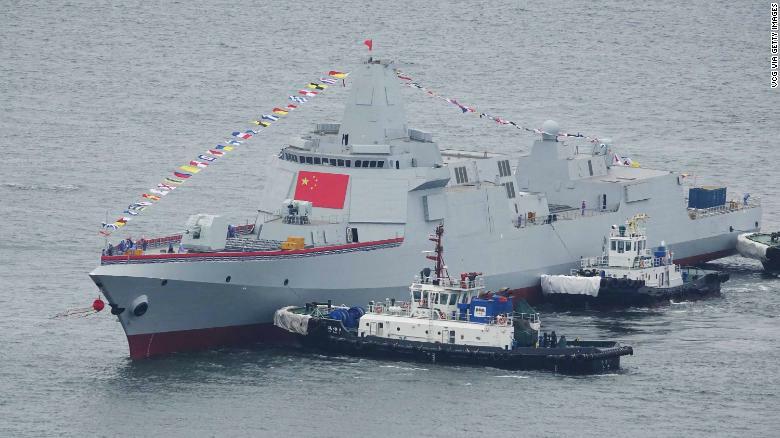 The new destroyers also boast a stealth design and high-end electronic battle management system to integrate Chinese aircraft carrier battle groups, the China Daily report said. “This ship … is designed for escorting Chinese aircraft carriers to more distant regions such as the Middle East,” said Heath. That would give China a so-called “blue water” navy, one that can operate far from homeland coasts, something that right now only the US Navy can do in overwhelming numbers across the world’s oceans. “The PLA Navy is progressively building a particularly well-defined ‘blue water’ fleet that will be in place at a certain date,” said Peter Layton, a former Australian military officer and now fellow at the Griffith Asia Institute. But through the Type 055’s sheer size, it can send a message in waters closer to the Chinese mainland too. “The Type 55As are big, very big,” said Layton.”The ships are a demonstration of the power, prestige and indeed majesty of the Chinese state and its ruling party,” he added. The Ticonderoga-class guided-missile cruiser USS Antietam is the closest US match to China’s new Type 055A destroyers. China’s new ships displace about 3,000 more tons than US or South Korea warships that have been the ones to look up to in Asian waters. 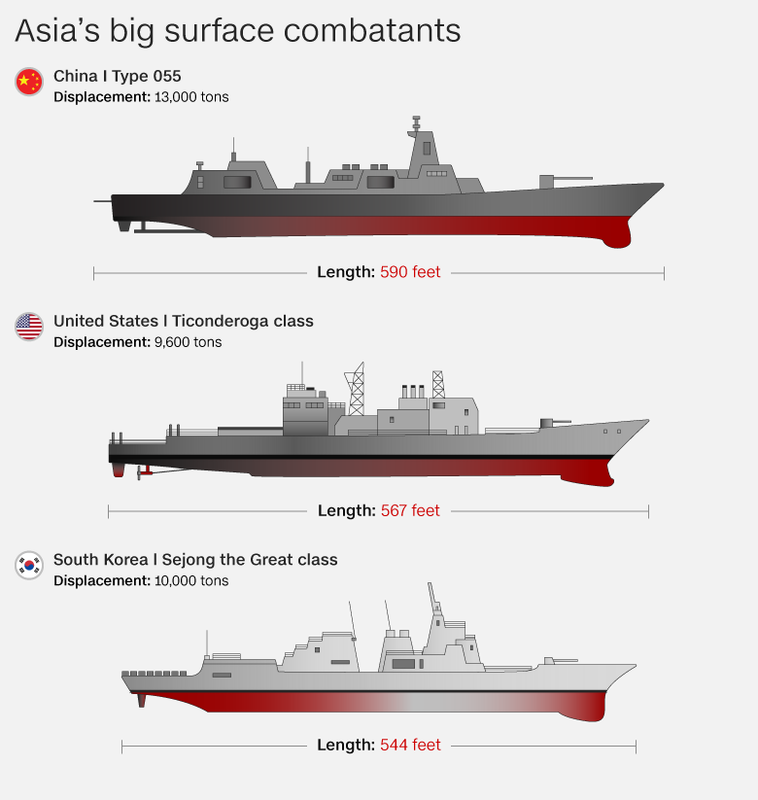 In the South China Sea, the Type 055As will have a considerable size advantage over the US Navy’s 10,000-ton Ticonderoga-class cruisers and 9,000-ton US Arleigh Burke-class destroyers. “The Type 55As handled aggressively they might be able to crowd US Navy ships out simply by their size,” Layton said. In the optics test outside China, big is almost always better, he added. “It could be that China places more weight on naval diplomacy and thinks port visits from a very large warship will simply overawe the locals,” Layton said. Back in China, the July 3 double launch made big statements about what the US and its Asian allies, and indeed the world, can expect from Beijing in the future. The two Type 055s join two others put into the water in June 2017, and April this year. Those ships came off a production line in Shanghai. The most recent two came off lines in Dalian, in Liaoning province, according to the China Daily. Maintaining two simultaneous production lines for one model of ship, especially in the same shipyard, is pricey, showing Beijing ranks delivery schedule as more important than cost, Heath said. “China will pay whatever it takes to get them finished to a specified deadline,” he added. Beijing will pay whatever it takes to stand toe-to-toe with the US Navy, said Carl Schuster, a former director of operations at the US Pacific Command’s Joint Intelligence Center. He said he expects China to build around 20 of the high-end Type 055s and augment them with smaller Type 054 frigates and aircraft carriers in service or under construction to field four carrier battle groups by 2030. Other shipbuilding is underway for amphibious assault ships — essentially baby aircraft carriers — and helicopter platform docks that can move and deploy Marine ground battalions, said Schuster, now a Hawaii Pacific University professor. And China has been leaking through state media that it’s working on things like an electromagnetic pulse cannon, hypersonic aircraft and the most modern of launching systems for its aircraft carriers, he said. “China is indeed sending the signal that it is both expanding the PLA Navy and equipping it with modern naval combatants equal to that of the US Navy,” Schuster said. 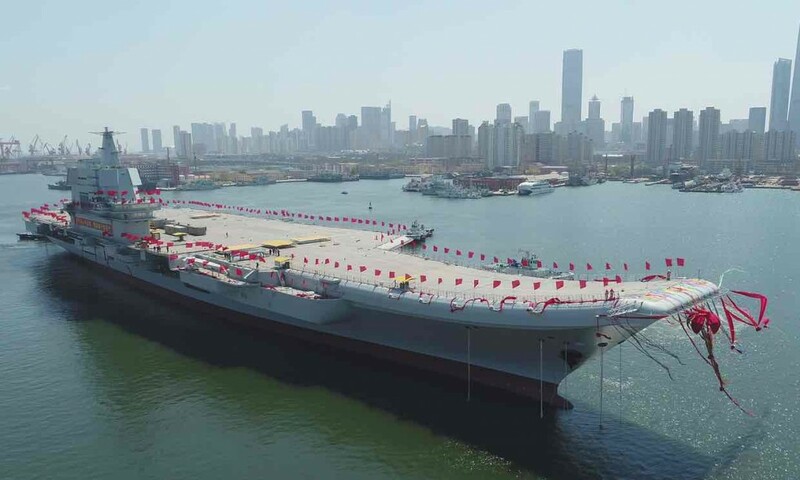 The China Daily report said the two Type 55As launched on July 3 would soon begin sea trials, where crew and engineers will make sure everything works as planned. Those trials have yet to be completed for the two previously launched Type 055s and no estimation was given on when they might actually be ready to be commissioned and join a carrier battle group.